It's 5.30 pm. A smog-blanketed day. Maddening Diwali traffic. After two hours of driving, one reaches a high-rise in Gurgaon to meet a mini supercomputer. He's all alone. His parents are at work. 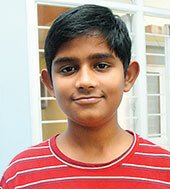 That hardly matters for 15-year-old Saswat Satapathy , the youngest National Memory Champion in the world. He has more weighty matters to think about. Like the impending World Memory Championship (WMC) in London from December 14-16 where he wants to win the Grandmaster title. Serious and confident, Saswat is the boy-next-door , ambling in shorts and T-shirt . He wants to show his skills. One writes a 15-digit number â€” 743280947328127. He focuses on it, closes his eyes and in 20 seconds rattles it off. Backwards too. Seeing one's astonished look, he explains, "I convert every number into an object and weave a story around the digits. So, 74 stands for Taj Mahal, 32 for book, 80 for feathers, 94 for Coca-Cola , 73 for lawyer, 28 for car, 12 for plane and 7 for stadium. The story I made is: I went to Taj Mahal and found a book of feathers. These were pushed into the eye and Coca-Cola gushed out along with a lawyer who then sat in a car which became a plane which crashed into a stadium." Stumped? But these are small tasks for Saswat . He has memorized 500 years' calendar and 500-digit numbers. There is a method in his brilliance. He follows a concept called COMBS â€” colourful , moving, big and strange â€” wherein the brain will capture anything which has these four elements. "I exercise my brain for an hour every day. For London, I need to remember 1,000-digit numbers in one hour." Ask Saswat which day of the week will be January 31, 2014 and he says, "Saturday...no, Friday." His father, Debasis Satapathy, an HR executive , who walks in then explains, "He goes wrong when he's distracted." His phenomenal memory was noticed when he was six. He was taken by Debasis to a training camp where memory coach Venkat was showcasing his skills. "Saswat came home, practiced some tricks and the next day memorized a 20-digit number," says Debasis. "Seeing his potential, I put him under the tutelage of Anant Kasibhatla , Venkat's son." Saswat took flight under him. He won two medals each at the WMC in China in 2010 and 2011. These annual championships began in 1991 and participants are tested in 10 disciplines. "My expertise is in spoken numbers where the computer calls out one number per second and one has to remember 200, 300 and 500-digit numbers. I have reached 76-digits . I can also remember the sequence of a deck of cards in 56 seconds and hope to get into the Limca Books of Records." So what's the secret of his memory â€” genes or training? While Debasis says it's not a God-given gift, genes have a part to play. Saswat's mother, Sujata Mishra, is a Ph D in nuclear chemistry from IIT-Delhi and teaches in an engineering college. "My father has a bad memory," says Saswat. He's not a topper though. "I am usually third in class," he says. "But yes, memory helps me remember data such as periodical tables." He also represented India in the World Mathematics Championship in Germany in 2011 and watches Shakuntala Devi, the maths wizard. "My friends say I am the future Shakuntala Devi," he says casually. Anant says Saswat's perseverance is his forte. "He practices daily. There are times when we've trained for six hours." Anyone can get a good memory by doing brain exercises, he says. "Try not to use a calculator, mobile or a shopping list. Just memorise." Surprisingly, it's biology that's Saswat's favourite subject. "I want to be a cardiologist." His supreme focus is evident in the black-and-white board adorning his bedroom door. 'Dr Saswat Satapathy, professor of cardiology , AIIMS,' it proclaims.His principal , Dr D R Saini of DPS, R K Puram, has showcased him at many forums. "In March, I was felicitated by President Pratibha Patil during the school's 40th anniversary. I feel nice about that," says Saswat. He's also given presentations at IIT-Delhi .